This in-depth introduction to SPC examines the technical aspects of the practices and procedures that are used to apply the quality management system in manufacturing. Provides a description and history of SPC along with an analysis of how it is applied to control quality costs, productivity, product improvement, and work efficiency. Includes a new chapter on the "Tools of Quality" that provides a complete explanation of the seven basic tools. Presents an improved discussion on the nature of control charts and a complete rewrite of most of the text to better facilitate an understanding of current trends in quality management. Covers unusual but important topics such as, humanistic concepts, DOE (design of experiments), and the probability rules and distributions needed for acceptance sampling. Takes special care throughout to fully explain how to read and interpret the various control charts used in the implementation of SPC. 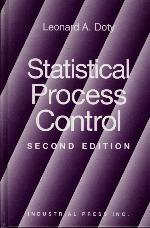 The Nature of Statistical Process Control. The Tools of Quality. The Normal Curve. Basic Control Charts. Specialized Control Charts. Process Analysis and Control. Other Probability Distributions. Acceptance Sampling. Standard Sampling Plans. Design of Experiments. Appendix. Review of Algebra. Linear Interpolation. Tables. Bibliography. Index.